Upon arrival at Kathmandu airport we meet & greet and transfer you to your chosen hotel in Kathmandu. The rest of the day is free for you to settle into your hotel and relax, or start exploring the local area. Following a morning pre-tour briefing we head into central Kathmandu for a tour of the city. We visit Durbar Square, with its numerous temples and the old royal palace, we take a walk up to the top of Swayambunath Stupa, for a great view over the city, and of course there is plenty of time to enjoy the numerous shops and stalls along the way. The evening is free for you to try out one of the many local restaurants. Today we head to the nearby city of Bhaktapur which offers some great examples of the wonderful traditional wooden architecture of Buddhist and Hindu temples. 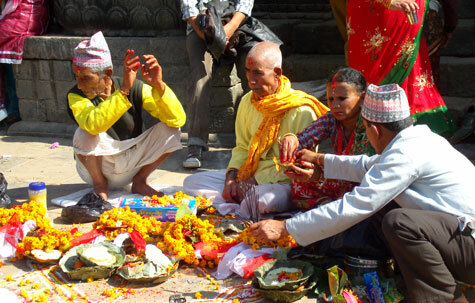 We also include a visit Tilkot and Kathmandu's oldest temple - Changu Narayan. You some more free time this evening to continue exploring this interesting city. We travel by road to Chitwan National Park this morning. The drive offers a great chance to see rural Nepal as we leave the hills and travel down onto the Terai. The landscape can be breathtaking in places, with snow-capped peaks, raging rivers and traditional hillside villages. Arriving in Chitwan we check in to our wildlife lodge and the rest of the day is free to relax. We spend the next two days exploring Chitwan National Park in search of animals such as tiger, rhino and wild elephant. We’ll take a safari on the back of an elephant, a river ride by canoe, a jeep safari and a walking safari, and we’ll also enjoy a village tour to see first hand the traditional day to day life of the locals. Today you have a little more free time in Chitwan and also an Elephant Ride. In the afternoon we drive to the UNESCO World Heritage site of Lumbini. The city of Lumbini is a pilgrimage site for many Buddhist, who come here to visit the birth-place of the Lord Buddha. Later, in the afternoon we drive to Pokhara. This laid-back lakeside town is a gateway to the mountains and the views of the Annapurna mountain range are incredible. It’s a great place to relax and there are plenty of things to do and see in and around the town. We have a full day of tours around Pokhara today. We'll visit the Peace Pagoda, Daryalling Monastery and the Tibetan refuge camp. After lunch you'll visit the Devi Falls and caves before returning to Pokhara for a free evening. Today is free for you to enjoy Pokhara and its surroundings. Optional activities include day walks to Sarangkot, a boat ride on Lake Phewa, and a cycle ride into the hills. Today we head back towards Kathmandu. Along the way we'll stop to visit Gorkha Durba Newari before continuing to the historic trading town of Bandipur. There is plenty of time to explore this interesting village, with its traditional bazaar and town centre, and take walks into the surrounding countryside. We spend the night in Bandipur in a basic but comfortable hotel. After a walk around the village this morning we continue our journey back towards Kathmandu stopping at the town of Dhulikhel. Perched on the edge of the Kathmandu valley, this small village offers excellent views of the Himalayan Mountains, including a distant glimpse of Mount Everest (on a clear day!). After enjoying the sunrise over the mountain views we have a free day in Dhulikhel. Our guide can help you to organise additional full or half day walks and rafting on the Bhote Khosi river. Winding our way through the countryside is like turning back the clock, as we pass through many small villages seemingly untouched by time. En route we take time to visit Boudhnath Stupa and the Hindu temple of Pashupatinath before driving back into Kathmandu.